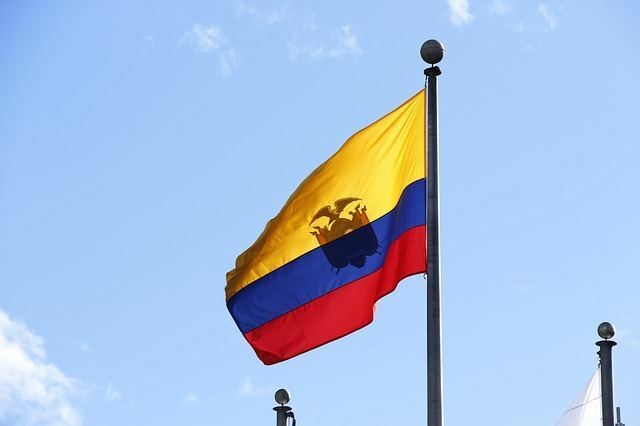 Quito is the capital of Ecuador and a jumping off point for all Ecuador points of interest. The city is quite unique. 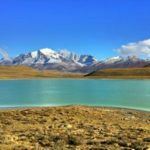 It sits at an elevation of 9,350 feet (2,800 meters). La Paz, Bolivia is the only higher capital city in the world. Quito is also surrounded by several volcanoes. Cotopaxi, the 2nd largest active volcano in the world can be easily seen on a clear day. 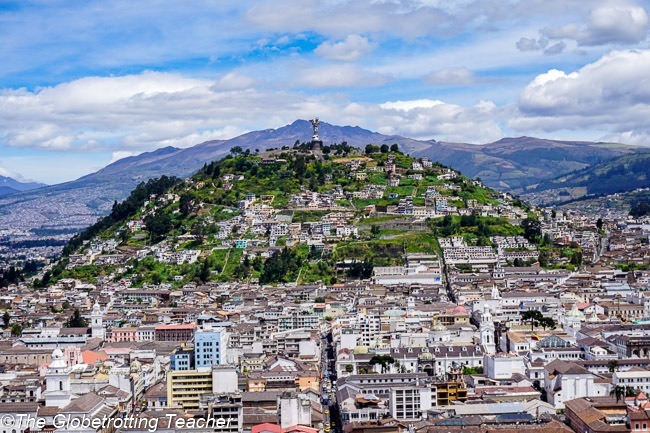 While Ecuador is popularly known for a trip to the Galapagos and its eco-diversity from beaches to cloud forest to the Amazon, Quito continues to inch its way into the minds of South American travelers. 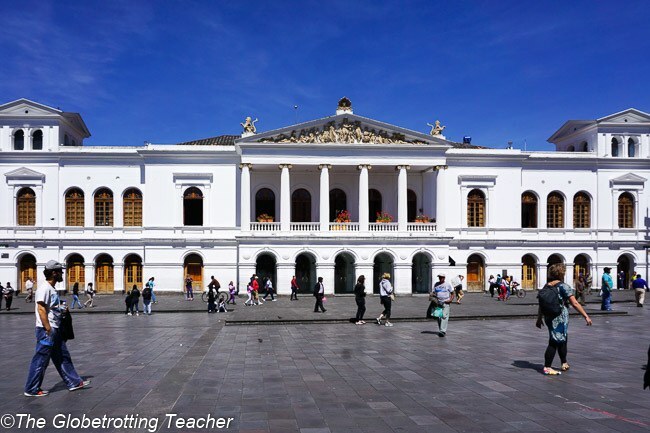 With so many cultural Quito things to do, travelers are staying longer rather than merely transiting through just to discover more of those Quito must see places. 1. Explore Quito Old Town. Quito’s old town is the city’s historic district. 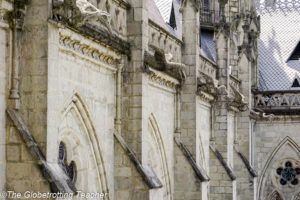 It’s been named a UNESCO Cultural Heritage Site because of its relatively unchanged Colonial squares, local shops, restaurants, and colorful architecture along hilly cobblestone streets. This central district is compact making it perfect for pedestrians to explore on foot. 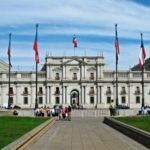 Begin in Plaza Grande where you’ll also find the Presidential Palace. 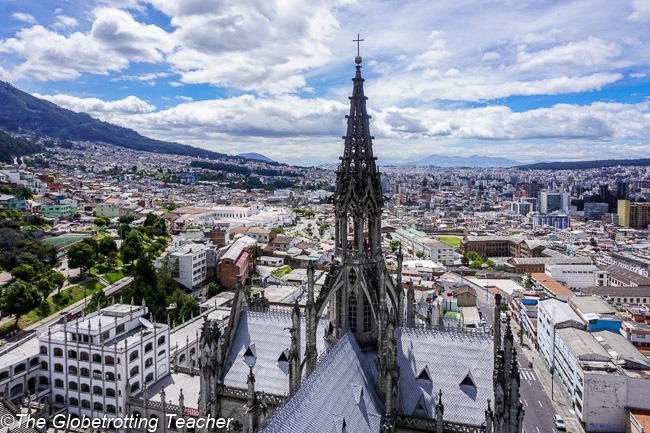 From there, wander to discover Quito’s cafes, museums, and churches. In the Plaza de San Francisco sits the 16th-century Roman Catholic San Francisco Church, home to the Virgin of Quito and many other works of art from the Quito School of Art. From the Plaza just outside, you’ll see one of the prettiest views of Quito’s old town. Not to mention, you’ll also be standing in one of the oldest spots in the city itself. 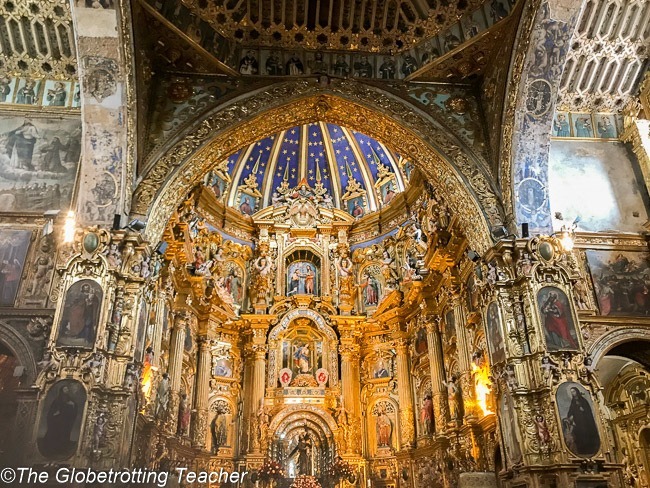 While not in the center of the old town, the Basilica del Voto Nacional is perched on a hill within a few minutes walk from the main pedestrian area. This Gothic Roman Catholic Church has Ecuadorian animals for gargoyles and gigantic stained glass windows. 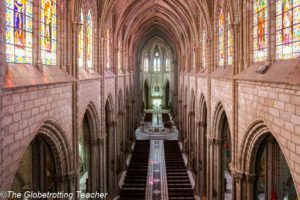 Of all 3 churches, this was one of the best places to visit in Quito Ecuador! Climb the towers for spectacular views over the church and the city. The highest climb is only for the most daring, vertigo-free travelers! Ride the Quito cable car up 12,000 feet (4,000 meters) for unparalleled vantage points overlooking the city of Quito in all directions. 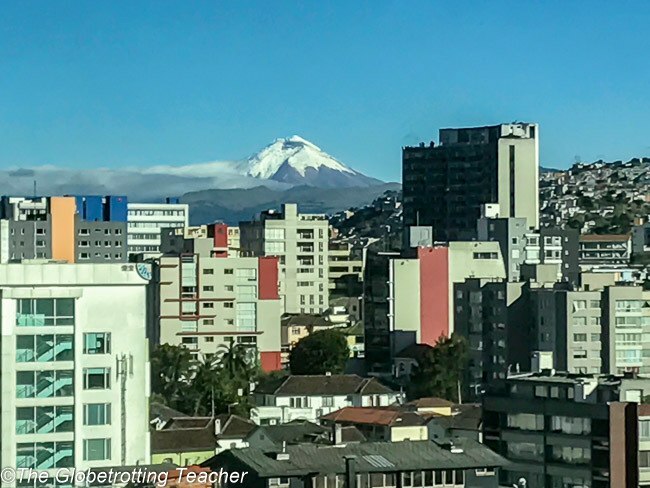 On a clear day, you can see Cotopaxi and several other volcanoes surrounding the city. 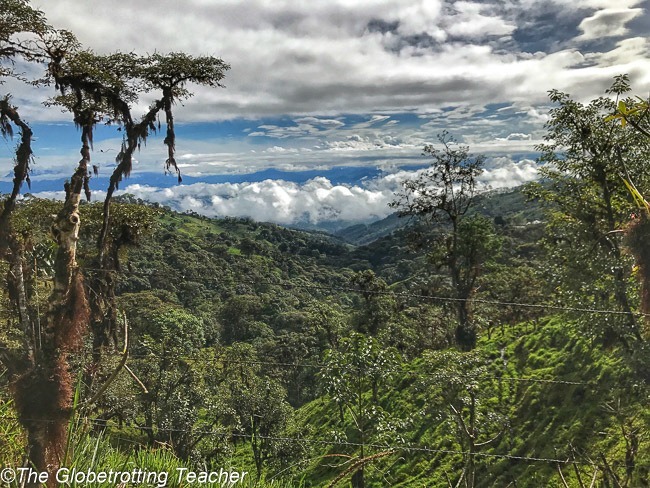 Once at the top, hike to the Pichincha Volcano or grab a coffee from the small cafe to keep warm as you look out from several panoramic viewpoints. 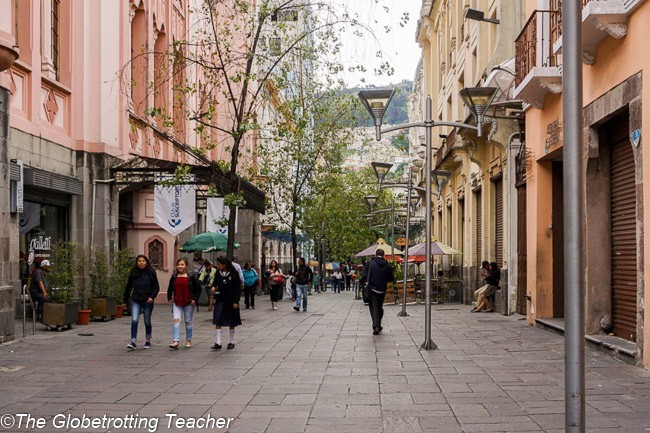 Even if it’s warm down below in Quito, come prepared with a warmer layer or jacket. The elevation climb comes with steady wind and cooler temps. It’s best to take a taxi up to the cable car and back from there. The Teleferiqo has their own taxi drivers for hire on the return trip. 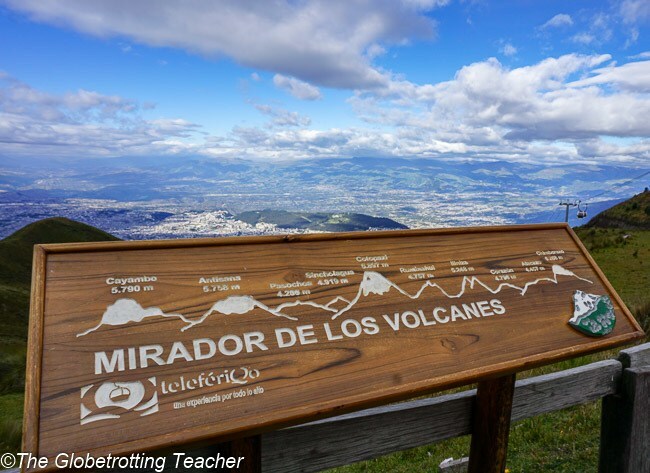 Looking for a different Quito tour or activity? 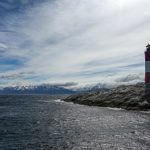 Find more fantastic traveler-reviewed suggestions to fit your trip goals. 4. Walk along Quito La Ronda. Calle de la Ronda is more than just a pretty spot to take photos. This cobblestone street in the old town is lined with artisan shops, cafes, and art galleries. It’s livelier as the day goes on and hosts ongoing cultural and heritage events throughout the year. 5. Visit the Virgin atop Quito El Panecillo. Quito is all about elevation. Near the old town, El Panecillo is a large rounded hill with a statue of the winged Virgin Mary. The statue can be seen from many points throughout the city. 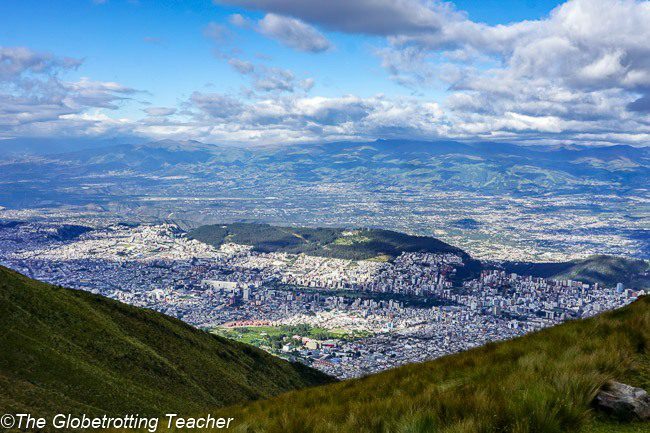 It’s not only a popular viewpoint overlooking Quito, but also a symbol of the city. While you can climb the hill with a group, the safest way to reach the top is by taxi. Definitely, don’t walk alone and be aware of your belongings. 6. Stand at the Middle of the World. For a few dollar bus ride to the outskirts of Quito, you can visit the equator. Mitad del Mundo is a monument and museum marking the hemispheric divide. You can even have your passport stamped showing you’ve stood on the equator. If you rather keep it simple, organized tours bring groups to the monument and museum daily. 7. Go to a Quito Market. Quito has several markets where locals shop and eat. 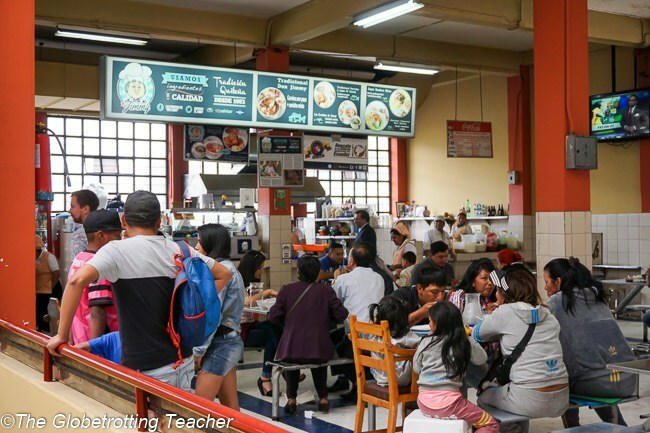 Mercado Central is near the old town and is a fantastic place to get Almuerzo (or lunch)! You’ll find cheap, delicious, local eats and get a glimpse of daily life for Quitenos. 8. Join a free walking tour. This is always a great way to tour a new city, especially to help you get oriented after first arriving. 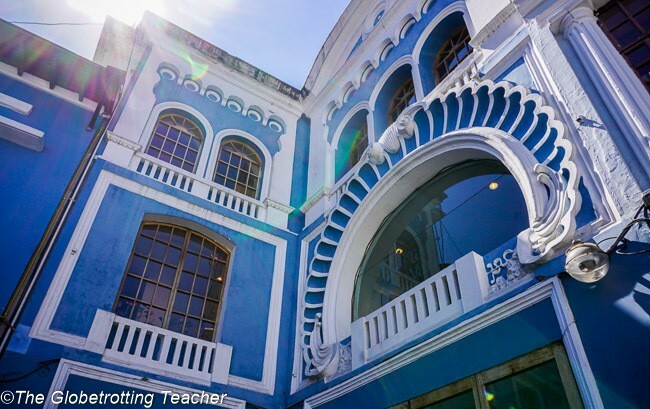 The Community Hostel Quito offers a Free Walking Tour led by a local guide who’ll talk about the history of Quito and the culture of the city. 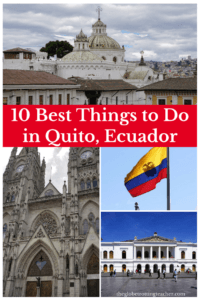 Visit top sights in the old town so you know what to do in Quito Ecuador. Plus, get local suggestions for where to eat and shop. Tours are Monday-Saturday rain or shine at 10:30 am and 2:30 pm. If you have an outstanding guide like I did, show your appreciation with a tip. 9. 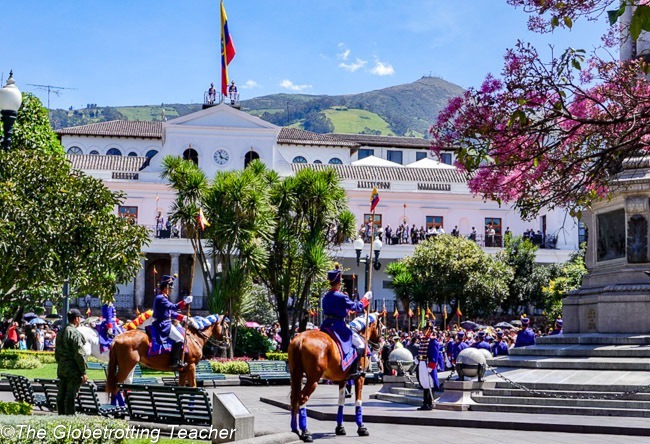 Watch the Quito changing of the guard. Every Monday morning in the Plaza Grande, just outside the Quito Presidential Palace, a formal ceremony is held to mark the changing of the guards. The Plaza Gets very crowded (watch out for pickpockets!) but it’s a great display of patriotism. There are horses, a marching band, and even the President himself attends by overseeing the events from the balcony of the Presidential Palace. 10. 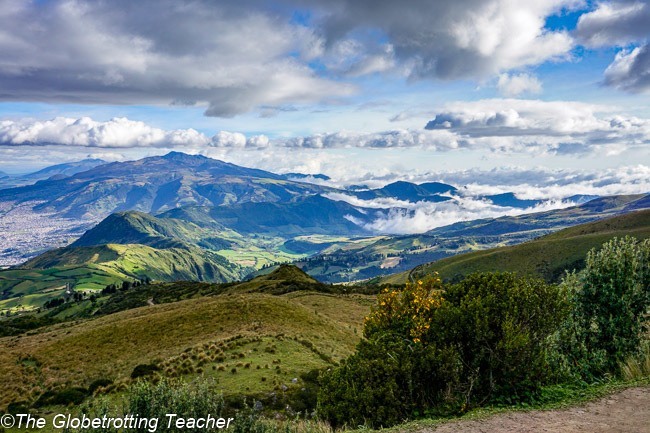 Plan a day trip from Quito. 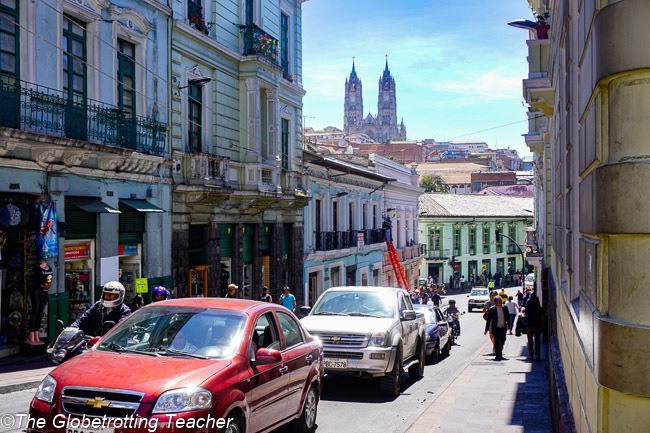 Quito is the perfect day-tour starting point before venturing off for your Galapagos trip or Amazon adventure and there are plenty of things to do around Quito. 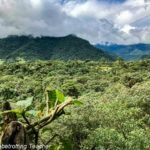 Visit Mindo in Ecuador’s cloud forest. Eco-adventure lovers will love hiking, zip lining, mountain biking, and river rafting in Mindo. While others can take chocolate tours and go on bird and butterfly excursions. Catch a local bus to Mindo or go with a guide. 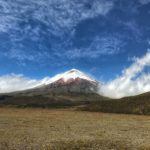 Discover Ecuador’s 2nd most popular National Park, Cotopaxi. 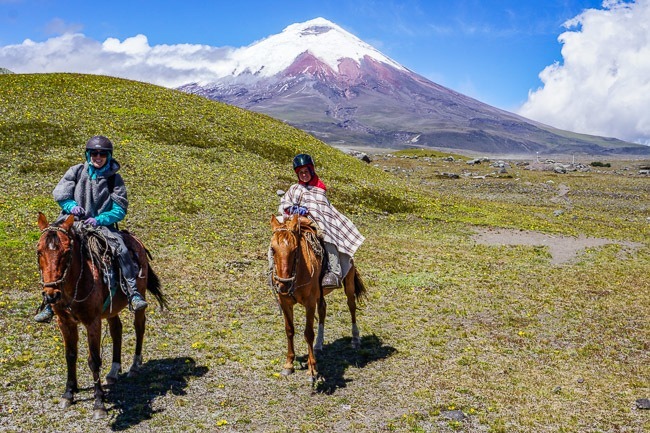 Hike up and bike down the volcano or horseback ride around the park with Cotopaxi always looming overhead. 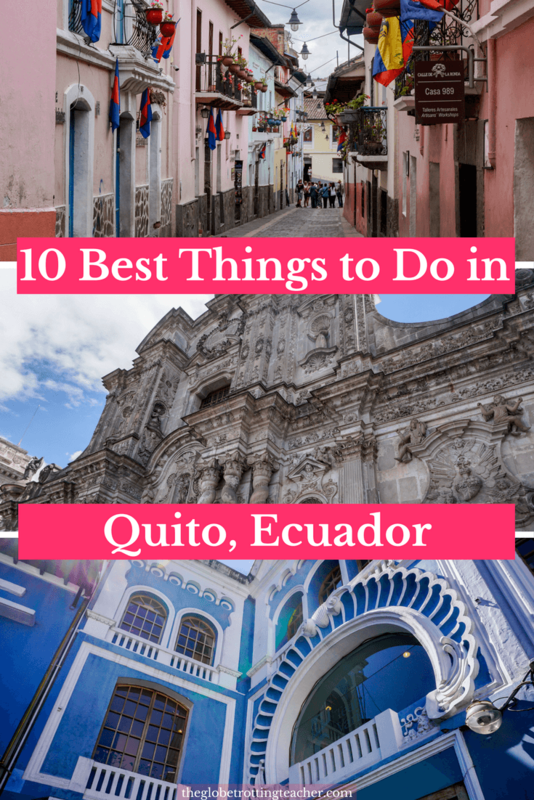 This is certainly one of the top things to do near Quito Ecuador! Day hike at Quilotoa to see the crater lake filled with turquoise water which formed when a volcano collapsed in on itself hundreds of years ago. Or haggle with locals over handmade crafts and goods at the Otavalo market. It’s the perfect place to find one-of-a-kind souvenirs to bring back home. Admittedly, I was torn about where to stay in Quito. The old town is full of charm and authenticity but can be really quiet at night. La Mariscal or the new town is definitely more touristy with an active nightlife scene. In the end, I stayed in La Mariscal and would gladly do so again. 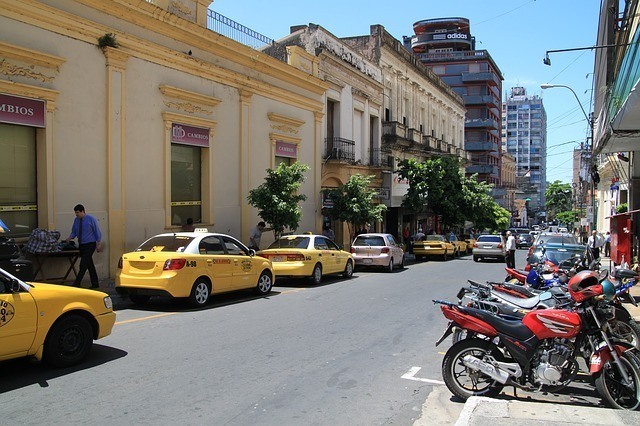 There were plenty of hotels, shops, and restaurants within easy walking distance of Plaza Foch. (Traveling with my 10-year-old nephew, close-by food options simplified dinner.) By day, (see Quito night safety tips below), it also felt like one of the safer areas of Quito to walk around. 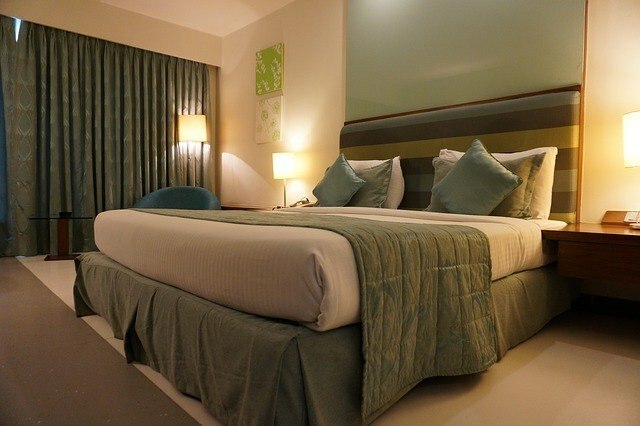 The neighborhood has accommodations ranging from upscale hotels to hostels. After volunteering in northern Ecuador, I used Chase Ultimate Rewards points to splurge on Hotel Rio Amazonas. Check Latest Quito Prices or Book Now. A few other perks are the neighborhood’s easy access to the trams heading into the old town, as well as the numerous day tour meeting locations which are perfect for those early morning starts. If your Ecuador flight arrives at Quito airport late or you have an early morning flight, the best Quito airport hotel is the Wyndham Hotel. Check Latest Prices or Book Now. Quito is not as dangerous as it once was, but it has also acknowledged its crime problem and has taken steps to improve everyone’s safety. 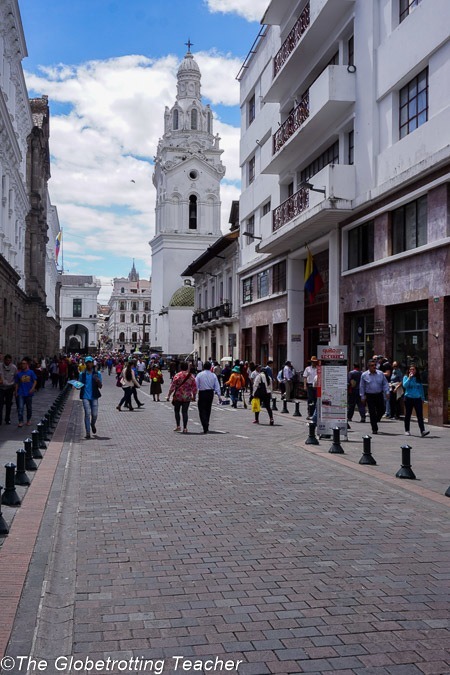 With that, here are a few things about Quito safety of which all visitors should be aware. Theft is a legitimate concern. 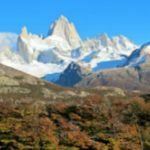 I’ve traveled solo in South America to Chile, Argentina, and the furthest reaches of Patagonia. Yet, Quito was where I felt the most need to guard all my possessions vigilantly. Be alert and watch your bag and your belongings on buses and while out exploring the city. 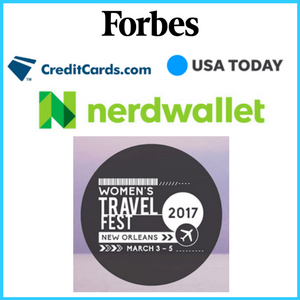 Only carry the necessities which include some cash in small bills, 1 bank or credit card, and a color copy of your passport or ID. No matter what anyone says, keep your bag in your hands or on your body at all times. Don’t flaunt electronic devices like phones, tablets, and cameras. I personally saw a thief grab someone’s iPhone as they were chatting and taking photos in the Presidential Palace Square. And, don’t let police presence lull you into feeling 100% secure. The Quito police force is at work trying to deter pickpockets, but you still need to be watchful. Fake taxis can be dangerous. Official taxis are yellow with orange license plates. They have working security cameras and a red panic button. The drivers turn on the meters without being asked. Also, you should look for a sign on the taxi that says “transporte seguro.” This is a sign the driver is official and follows the safety requirements. If you need a taxi from your hotel, ask the front desk staff to call one. If you’re out and need a taxi, try to look for a nearby hotel and ask them to help you get a taxi. Don’t share taxis and if your driver refuses to put the meter on, get out or, if you feel comfortable with the situation, negotiate a price before departing. Don’t venture out solo at night. La Mariscal and other neighborhoods have fun restaurants, bars, and nightlife. It’s best to enjoy them with a group. Solo travelers might consider joining hostel friends or even a night tour or pub crawl. Deciding what to wear in Ecuador can be quite a challenge! Quito and all of Ecuador’s weather is quite changeable. Because of the elevation, the weather can actually be quite cool, particularly at night. Long sleeve layers and a waterproof jacket are recommended. 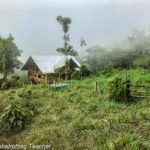 If you’re headed into the cloud forest or Amazon basin, pack waterproof rain boots and a base layer for warmth and/or sweat-wicking. Quito elevation affects everyone differently. You may need to allow your body to adjust. 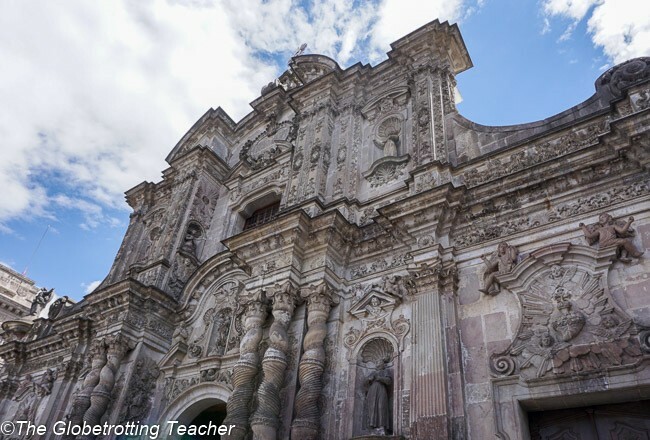 Including a couple of days in Quito to begin your Ecuador itinerary will allow you to acclimatize before heading off to places like the Galapagos, the Mindo cloud forest, or the Amazon Basin. Respect your body if it needs to slow down. You don’t want to get sick and ruin a larger portion of your trip. Be sure to drink plenty of water. 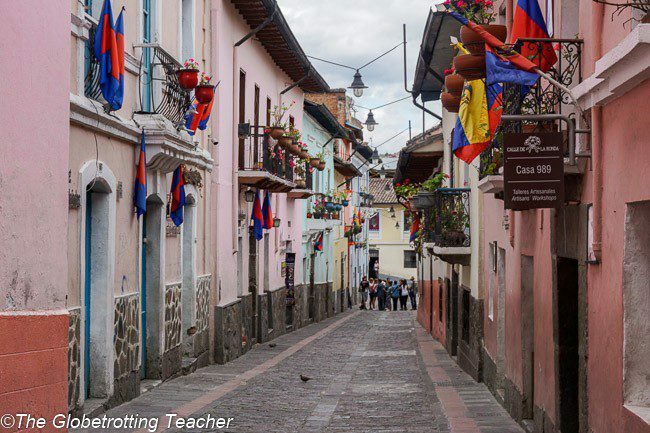 Whether you’re in Ecuador for the Galapagos or another eco-themed trip, make time in your itinerary for all the things to do in Quito. The cultural and historical sights in Quito will absolutely make your time in Ecuador that much more memorable. 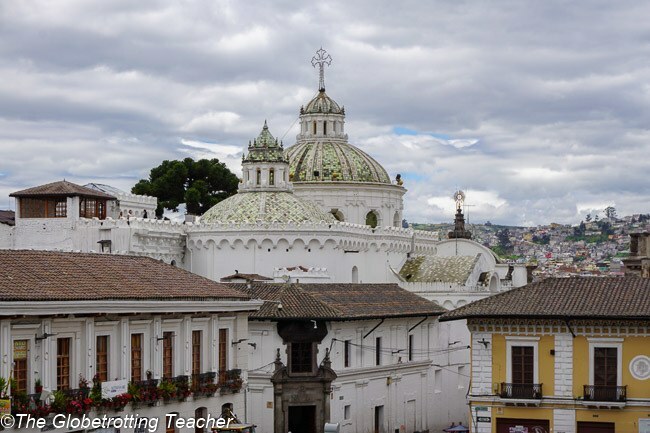 Is Quito on your list of South American cities to see? 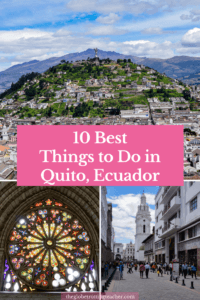 If you’ve been what would you add to this things to do in Quito list? What stunning architecture. I love the tiles on the dome of the church/cathedral. I’ve read about the gold interior elsewhere – something I do need to see for myself for sure. 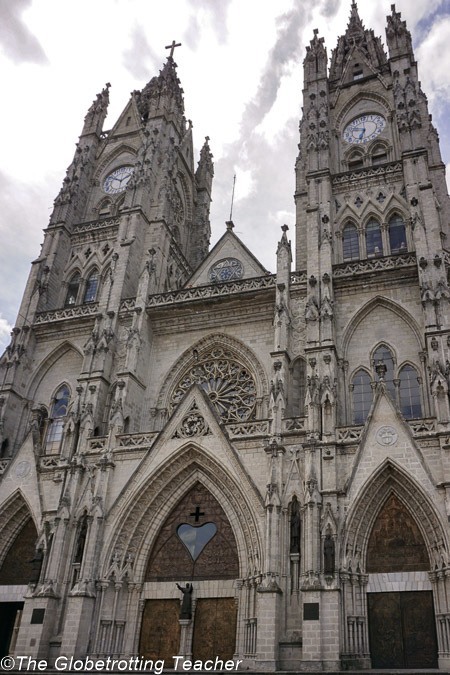 Those green mosaic tiles on the church domes were my favorite architectural feature in Quito, Fiona. They’re so unique. Glad you’ll be able to put the tips to use. 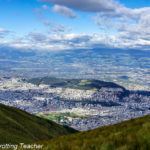 This is a great and extensive list for people like me who are thinking seriously about going to Quito! Although it looks really safe, I am quite concerned about the presence of thieves and not being able to go out alone at night… oh well… those are just petty things and happens just about anywhere in the world I guess. 🙂 How long were you there for? I visited Quito last year (I was there during the earthquake in fact! ), and really enjoyed my visit. You give a great overview of the city( I personally loved the La Ronda neighborhood) as well as day trip options. I love Quito! A few of these things I haven’t done, the changing of the Guard and the Quito market in particular. Good tip about the taxi safety here, I wasn’t aware. Look forward to getting back and seeing more of this amazing city! 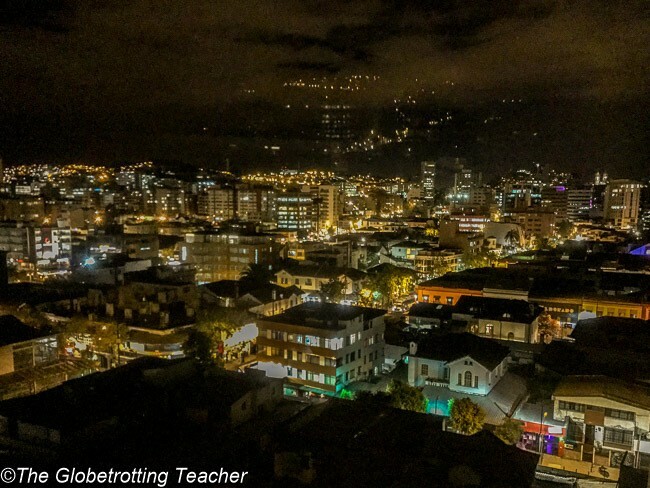 So nice to hear you’ve been to Quito and enjoyed it, Dorene! Hope you make it back soon. One of the best places to visit in South America is Ecuador. One of my volunteers before at the guesthouse where I managed is from Ecuador. He told me tons of things about this place and I’d love to go. Tho, as I’ve been reading your post about it and while scrolling down, I actually looked for the question ” Is Quito safe? ” haha. Travelers like us never miss this concern about a certain place especially if it’s our first time. It’s really common sense to take everything with precaution and “don’t flaunt electronic devices like phones, tablets, and cameras” is indeed a lifesaver. You’ve mentioned that police are always around yet, of course, you’re right, we are still responsible for our valuables. I haven’t seen or witnessed a thief snatched someone’s stuff away! Totally agree that Ecuador isn’t to be missed. Just take those common-sense precautions, Cathy and you’ll be all set! All seemed exciting till I read about the list of cautions to be followed. Imagine fake taxis! 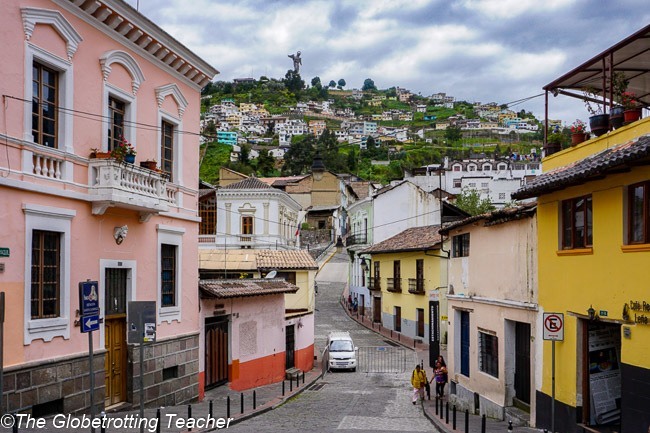 You’ve shown Quito off at it’s best – I had no idea it was so beautiful. I’d love to hike to the Pichincha Volcano, there is something about volcanos that are so primal and kind of mystical. Shopping at the markets would be fun, too – and of course I’d want to travel on to the Galapagos. Dream trip! Thanks so much, Carol. 🙂 If you love volcanoes, save time to see Cotopaxi either before or after the Galapagos. It’s an Ecuador must! What an amazing first photo overlooking the view of the city. Sprawling and incredible. We have friends from La Paz who have told us wonderful things about La Paz and Quitos. Never been there so it’s wonderful to read and see the colonial architecture and churches. The market would be one of my first stops 🙂 Great tips about safety. Definitively noted and will keep in mind for when we eventually visit. Glad you had a blast. It was a blast, Rosemary! The markets and old town Quito have some great authentic food finds you’re sure to enjoy. I haven’t thought much about Ecuador but Calle de la Ronda looks like my kind of place. Old town with cobblestone streets and cafes — sounds perfect! Ecuador is so high on my list! I actually did;t realize just how much there was to do in Quito. It looks amazing! I had no idea there were all those volcanoes there though! I appreciate the candor about the safety issues in the city, though. While I didn’t use them for my Ecuador trip, I have booked activities for other destinations with them and always had a positive experience. Good luck and enjoy your South American travels!